Campaign for the American Reader: Pg. 99: Alexandra Natapoff's "Punishment Without Crime"
Pg. 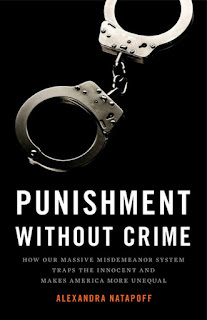 99: Alexandra Natapoff's "Punishment Without Crime"
Featured at the Page 99 Test: Punishment Without Crime: How Our Massive Misdemeanor System Traps the Innocent and Makes America More Unequal by Alexandra Natapoff. 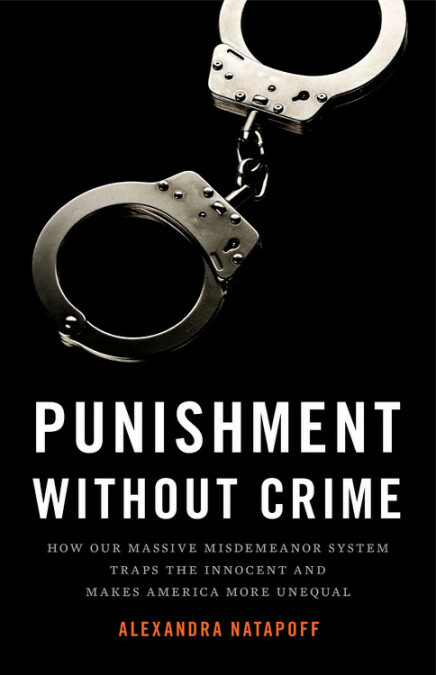 Punishment Without Crime offers an urgent new interpretation of inequality and injustice in America by examining the paradigmatic American offense: the lowly misdemeanor. Based on extensive original research, legal scholar Alexandra Natapoff reveals the inner workings of a massive petty offense system that produces over 13 million cases each year. People arrested for minor crimes are swept through courts where defendants often lack lawyers, judges process cases in mere minutes, and nearly everyone pleads guilty. This misdemeanor machine starts punishing people long before they are convicted; it punishes the innocent; and it punishes conduct that never should have been a crime. As a result, vast numbers of Americans — most of them poor and people of color — are stigmatized as criminals, impoverished through fines and fees, and stripped of drivers’ licenses, jobs, and housing. For too long, misdemeanors have been ignored. But they are crucial to understanding our punitive criminal system and our widening economic and racial divides. The Page 99 Test: Snitching. The Page 99 Test: Punishment Without Crime. What is Stephanie Kate Strohm reading? Pg. 69: Kate Quinn's "The Huntress"
Pg. 99: W. K. Stratton's "The Wild Bunch"
What is John Wall reading? What is Kristyn Kusek Lewis reading? Pg. 69: Lindsey Stoddard's "Right as Rain"
Pg. 99: Elaine Shannon's "Hunting LeRoux"
What is S. Andrew Swann reading? Pg. 69: James L. Cambias's "Arkad's World"
What is Jo Perry reading? Pg. 99: Kathleen Day's "Broken Bargain"
What is Christina McDonald reading? Pg. 69: S. Andrew Swann's "Marked"
What is W. K. Stratton reading? Pg. 99: Darius Bost's "Evidence of Being"
What is Laura Benedict reading? What is Snowden Wright reading? Pg. 69: Jo Perry's "Dead is Beautiful"
What is Elinor Lipman reading? Pg. 69: Laura Benedict's "The Stranger Inside"
Pg. 99: Noelle Gallagher's "Itch, Clap, Pox"
What is Amber Cowie reading? Pg. 69: John Fried's "The Martin Chronicles"
What is J. Albert Mann reading? Pg. 69: Elinor Lipman's "Good Riddance"
What is A.F. Brady reading? What is Darius Hinks reading? Pg. 69: Amber Cowie's "Rapid Falls"
What is Barry Eisler reading? What is Adele Parks reading? Pg. 69: A.F. Brady's "Once a Liar"
What is Padma Venkatraman reading? Pg. 69: Darius Hinks's "The Ingenious"
What is Jane A. Adams reading? Pg. 69: Renée Knight's "The Secretary"
What is Gareth Hanrahan reading? Pg. 69: Barry Eisler's "The Killer Collective"
What is Simon Ings reading? What is Ann Weisgarber reading? Pg. 69: Snowden Wright's "American Pop"
Pg. 99: Jack Kelly's "The Edge of Anarchy"
Pg. 69: Adele Parks's "I Invited Her In"
Pg. 99: Edward Humes's "Burned"
What is Lior B. Sternfeld reading? Pg. 69: Padma Venkatraman's "The Bridge Home"
What is Jane Corry reading? Pg. 69: Jane A. Adams's "Kith and Kin"
What is James Brabazon reading? What is Cynthia Harrod-Eagles reading? Pg. 69: Ann Weisgarber's "The Glovemaker"